As you can see, the wargamer has a smorgasbord of eras, battles, and armies to choose from. This is actually a picture of the first printing. The only thing different on the newer box is that it says "Second Reprint"
Much to the gaming community's relief, an anonymous donor was kind enough to bankroll the re-release of the game and all of the expansions for it. May he be blessed by the wargaming Gods. 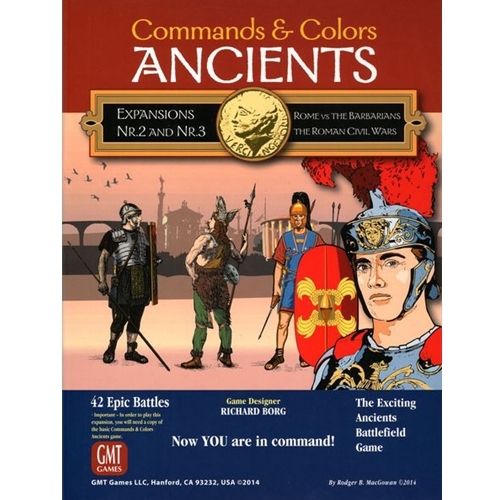 The base game, Commands & Colors Ancients, is needed to play all of the expansions. 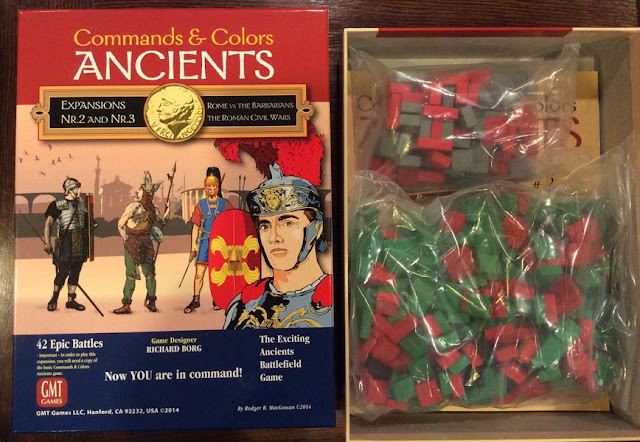 This review is of the new combined expansions 2-3. 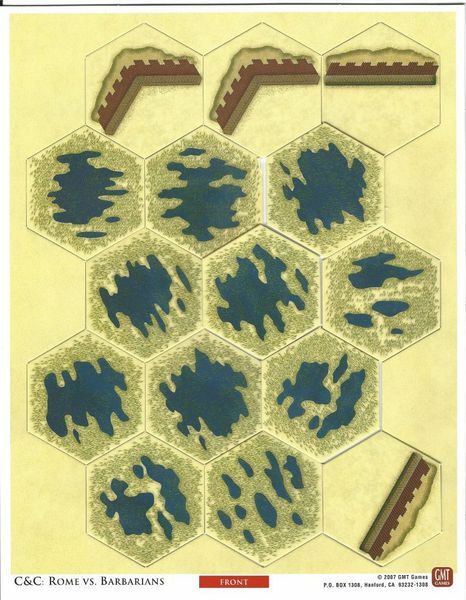 The expansion does not come with a mapboard as they originally did. This was to cut down on both shipping costs and the overall price of the expansions. Expansion #2 covers battles that feature Roma versus various Barbarians. The battles range in time from the Battle of Closium in 225 BC, to the Battle of Cefn Carnedd in 51 AD. There are seven battles alone that deal with the revolt of Spartacus. 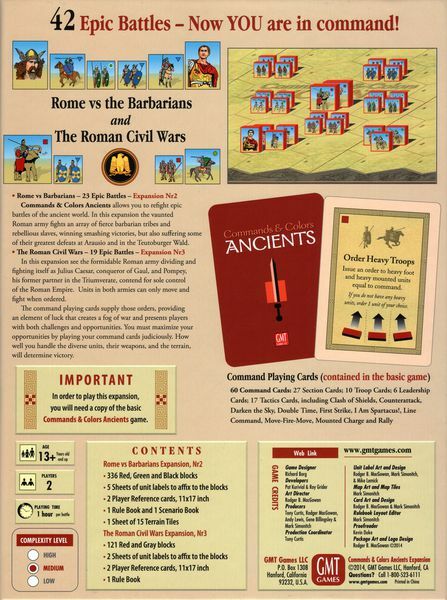 The next, Expansion #3, deals with the various Roman Civil Wars. These go from the Sullan Battle of the Colline Gate, to the last battle that was fought in the civil war between Pompey and Caesar, the Battle of Munda. The game components are ones you typically see in GMT Games, meaning that the production values are extremely high. The blocks are of four different sizes. The largest is for elephants, the next size is for leaders, and the medium size is for cavalry. The smallest blocks are for your Infantry forces. About the blocks, there are a ton of them to be stickered, and I mean a ton. For those of us who have arthritis or some other problem (I have a mashed right-hand thumb), it might be worth your while to pay someone to do it. Other than that, for those of you who are lucky, or unlucky, enough to have kids living with you, corral them into helping. The stickers themselves are very nicely done. 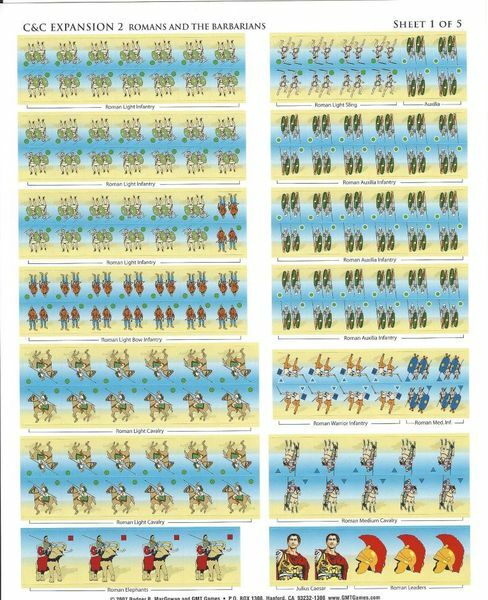 It is easy to distinguish between the forces by the size and their colorful picture. The two expansion rule books are well written and done in full color. This makes it extremely easy to setup the battles. Both expansion booklets have special rules for the battles listed.